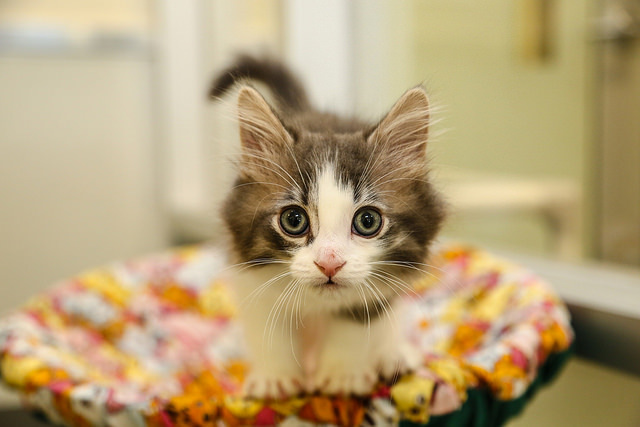 Every kitten season, the OHS helps hundreds of kittens like Stewart. We call it kitten season. And at the OHS, we make a lot of our plans around it — extra hiring, more supplies, extra budgeting, volunteer recruitment. It doesn't always happen at the same time each year. Sometimes the weather affects the date it will arrive. An early spring often means an early kitten season. In the past few years it has come later in the spring, even in June. But come it does, every year. It comes suddenly too. Generally in a matter of days. One Thursday, we will have 90 cats in the shelter and on the following Monday there will be 160. What is kitten season? It is when the boxes of kittens start appearing at our door, and the number of cats and kittens needing care soars. Last year, for example, the OHS took in an average of 17 animals a day in January. By July, the number pretty much doubled to 33. On some peak days, it can be 45. It is an enormous task to care for all those animals and it severely stretches our resources. But we get through it, and because of our donors coming through for them, so do the cats and kittens — who end up in loving homes. I would like to see a permanent end to kitten season. The key, of course, is spaying and neutering. And beginning last fall, with the launch of our mobile spay/neuter vehicle, the OHS is spaying and neutering Ottawa's cats in a big way. Studies tell us that, in a city the size of Ottawa, completing 6,000 spay and neuter surgeries a year will result in a precipitous drop in the number of homeless and unwanted cats, and so that is the number we are working toward. So, these our simple goals: end kitten season for good and in the meantime care for these little ones that need us — and you. If you are reading this article it is because you care. If you want to make a difference, you can adopt, volunteer or donate. Together, we really can make a difference.